Breakfast was amazing. 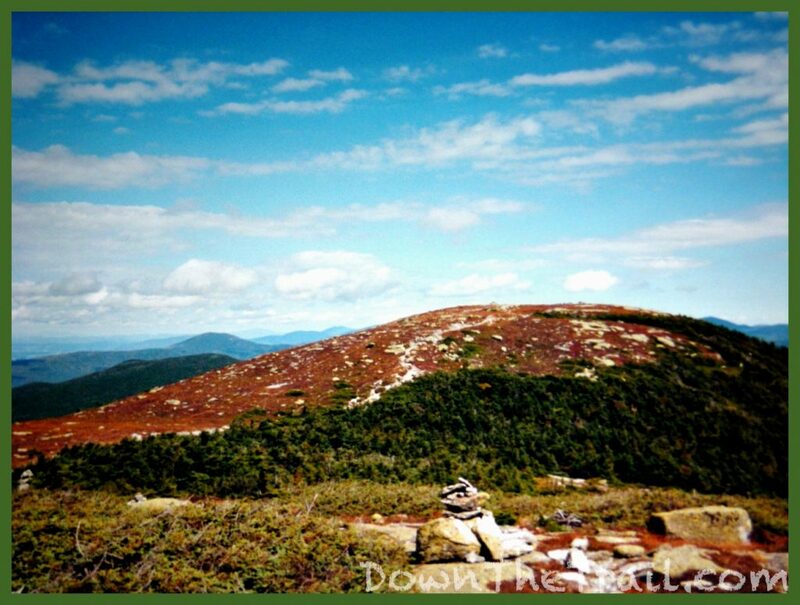 It was at the “Andover Lunch Restaurant,” known locally as “Addie’s Place,” and also referred to in the guidebook as “the town’s unofficial community center.” They had a special for thru-hikers. Well, it was more of a dare. 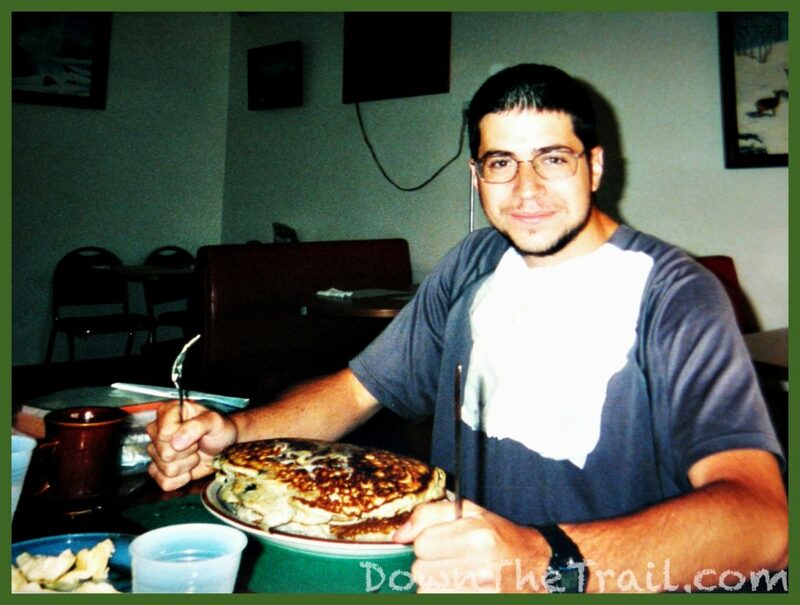 If you ordered their hiker’s stack of three huge pancakes and managed to eat all of them, you got them for free. I failed, but it was fun trying. I left town with Hollywood and SoFar, so we were a solid crew once again. Yesterday’s rain cleared and it was a clear, blue, beautiful day. This evening was a lot of fun. After hiking for about ten miles we came to a lightly-traveled paved road, which also happens to lead back to the town of Andover. This is where I think we saw the hiker called Big Red with his vehicle (As opposed to how I wrote about him in the last post). There’s a perfect little campsite with a stream where the road crosses the trail. Big Red (Or maybe somebody else that they knew) happened to drive by just a few moments after we got to the road – trail magic! Hollywood and SoFar got a ride into Andover to pick up some 6-packs of beer for us. Meanwhile I stayed back at camp and started gathering firewood. The guys returned with the beer in no time, and we had a great evening. A random day hiker took this group photo for us. The woods this morning had that special quality that’s only found on a sunny day after a lengthy, soaking rainstorm. SoFar backpacked with a frisbee, so it was all about beer and frisbee and fire this evening. We heard it through the grapevine that another solid rainstorm was on the way (Actually more like the remnants of a hurricane), so we got off the trail late this afternoon at the next paved road. Our destination was the small and awkwardly-named town of Oquossoc, where an establishment called The Horsefeather Inn B&B was said to accommodate AT hikers. We got there late in the afternoon. Nobody was present for us to check in with, and no means of contacted them were evident either. The door, however, was open, so we made ourselves comfortable and assumed somebody would be around later in the evening to check on things. Nobody ever stopped by. It rained all day long, as the remnants of a tropical storm or hurricane made their up to this part of Maine. So we certainly didn’t leave the B&B today. 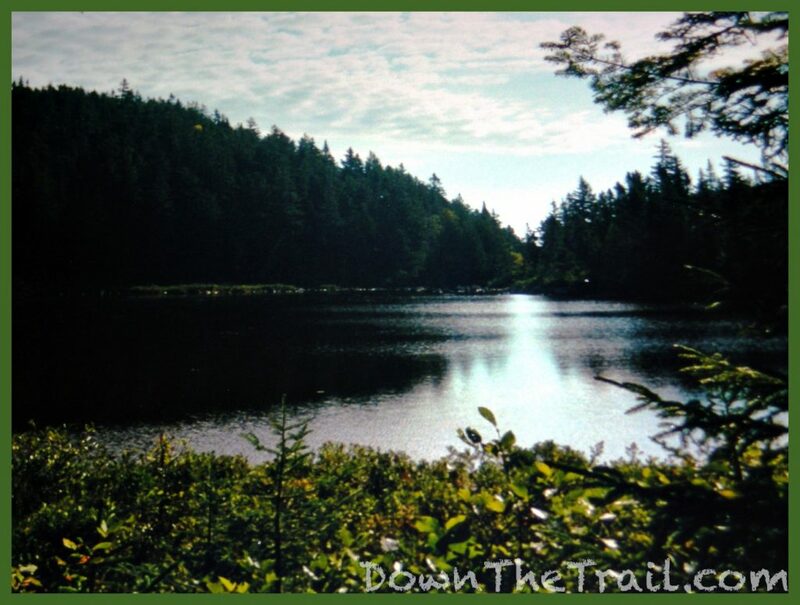 I think it was the hiker called Goldbond who joined us here mid-day – he was a younger guy in his 20s, like ourselves. The B&B had television set up with VCR and plenty of movies on tape, so we spent literally all day watching movies. We watched five whole movies! To this day that’s a personal record of mine, watching five movies in a single day. I don’t remember all the titles, but one of them was Forrest Gump, and the last one we watched was the Batman movie with Val Kilmer and Arnold Schwarzenegger. We made it out to a local store at one point to get plenty of food and beer and wine. We made a family-style dinner that we all shared. It was just spaghetti, but at least it was complete with garlic bread! There was still no sign of an owner or caretaker until late in the afternoon. It was a rainy, muddy day, and he was a little grumpy. Some of us were a little grumpy too, since we missed out the supposed included breakfast this morning (But were still charged full price). This wasn’t the most magical exchange between the hiking community and service providers. Our host took the money for our stay and we wouldn’t see him again until the next morning. Nothing was ever said outright, but unfortunately our interactions with him had a level of tension that boiled just below the surface. The weather didn’t clear very much the following morning, but we were getting cabin fever and agreed it was time to end our short hibernation in the small town of Oquossoc. Hiking throughout the first half of the day was foggy and ethereal, but wet. After thirteen miles we came to a paved road that goes into Rangely, and once again went into town for the night. I don’t have distinct memories of the night in Rangely, but I do know that they were certainly positive. The hostel was wonderful and included all of the basics that a hiker could possibly need. I think that we ended up at a local bar in town too. Eventually in Maine I reunited with a handful of hikers whose presence was just so uncanny that it elevated the rest of my trip to a new level. I don’t know exactly where I first encountered them, but it could have been Rangely. So I might as well tell you about it in Rangely. The first is Yahtzee and his friends, Sandfly and Kubiak. 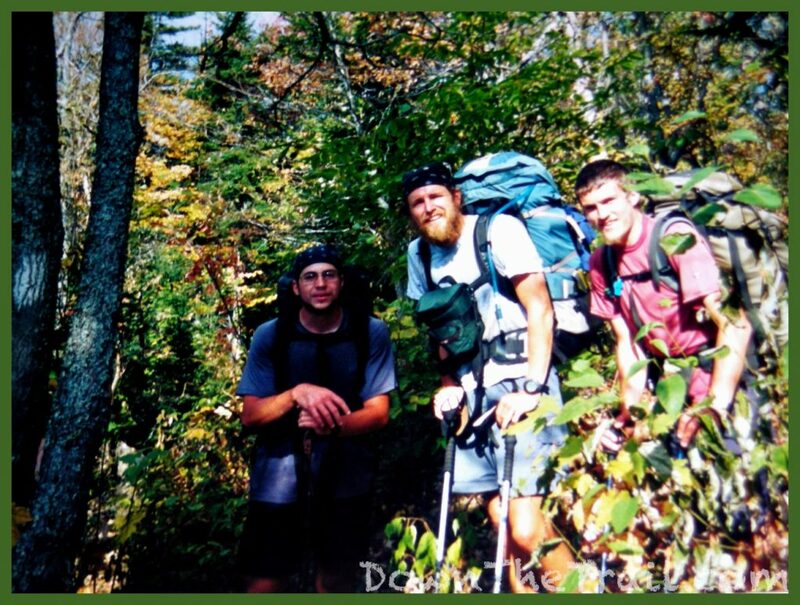 I hiked a bit with Yahtzee in the last days of 2001, at the back of the thru-hiking herd. I enjoyed his company. For example there was the afternoon of despair at Dennytown Road, and a sublime morning at Upper Goose Pond. We even reunited the following spring at Trail Days. What’s most worthy of mention is that our paths on the Appalachian Trail for these couple of years had similar trajectories. 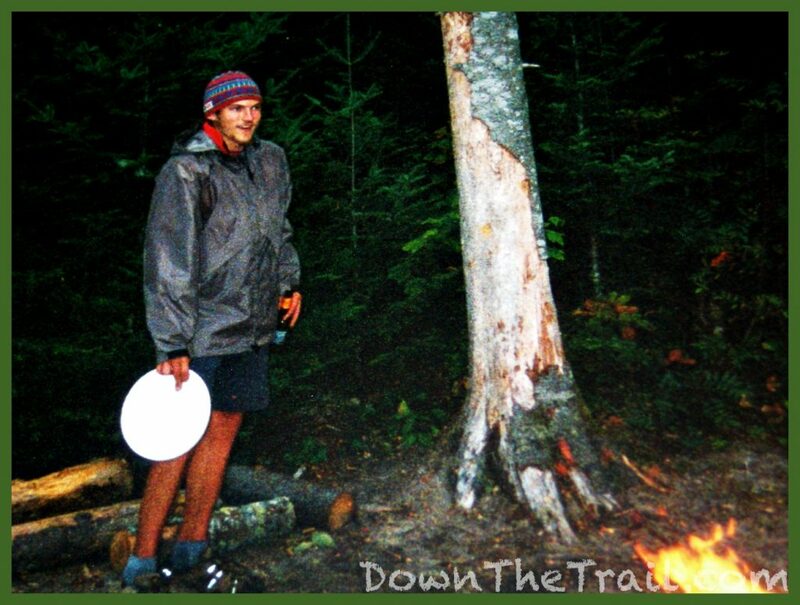 We’d both initiated our thru-hikes in 2001, but failed and abandoned them. Now we found ourselves coincidentally reunited here in Maine with a similar purpose – to finish what we’d started. We were both from Pennsylvania. 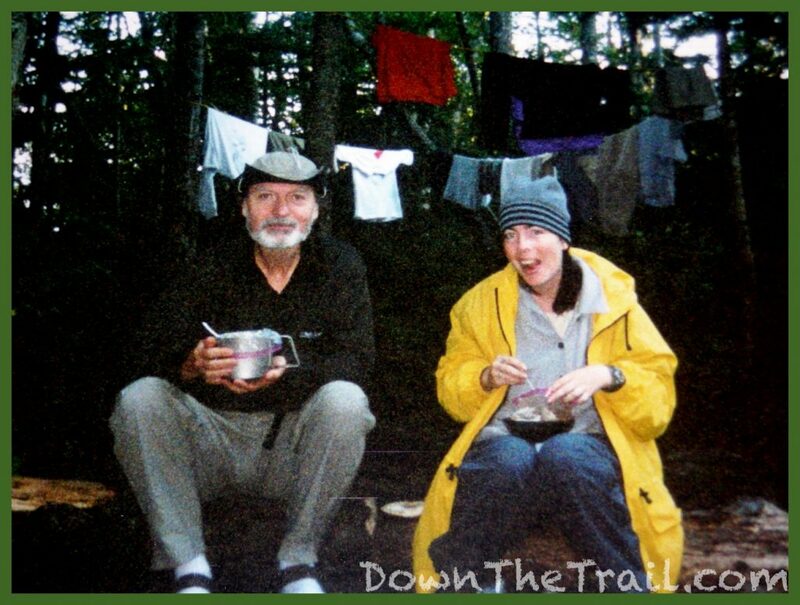 I’d also met his friend, Sandfly, in passing on the Trail in 2001. 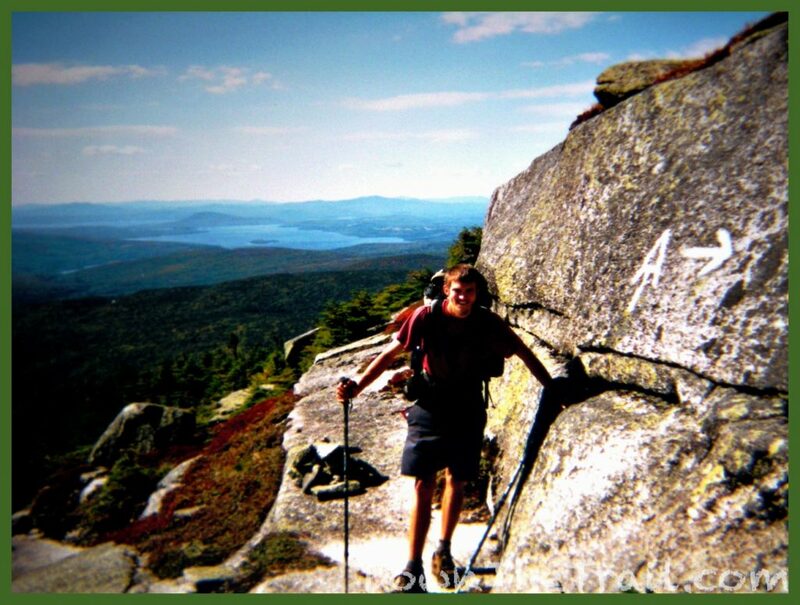 Sandfly was ALSO from Pennsylvania, ALSO abandoned his thru-hike in Vermont like me, and was ALSO here to finish what he’d started. Their third companion, Kubiak, was ALSO from Pennsylvania. Kubiak and Sandfly were old friends from Punksatawny. 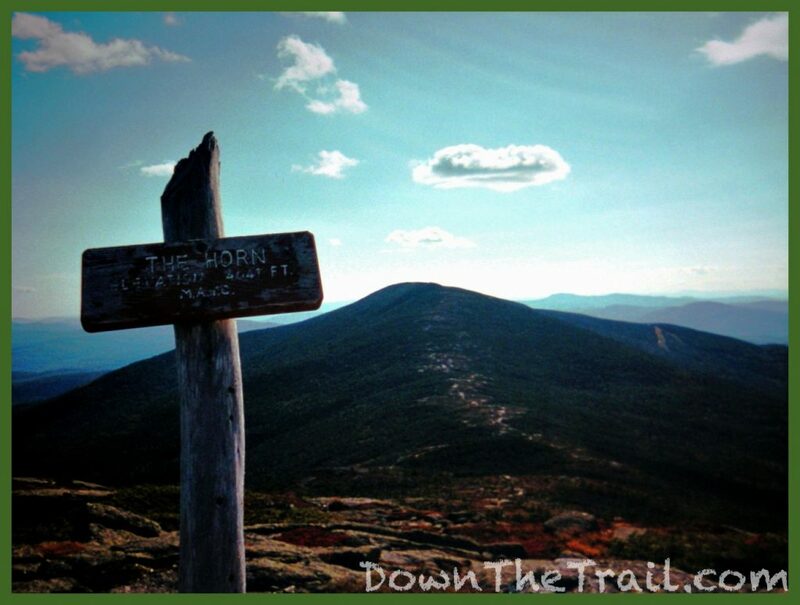 Kubiak had hiked the AT a couple of years ago, as well as the PCT. 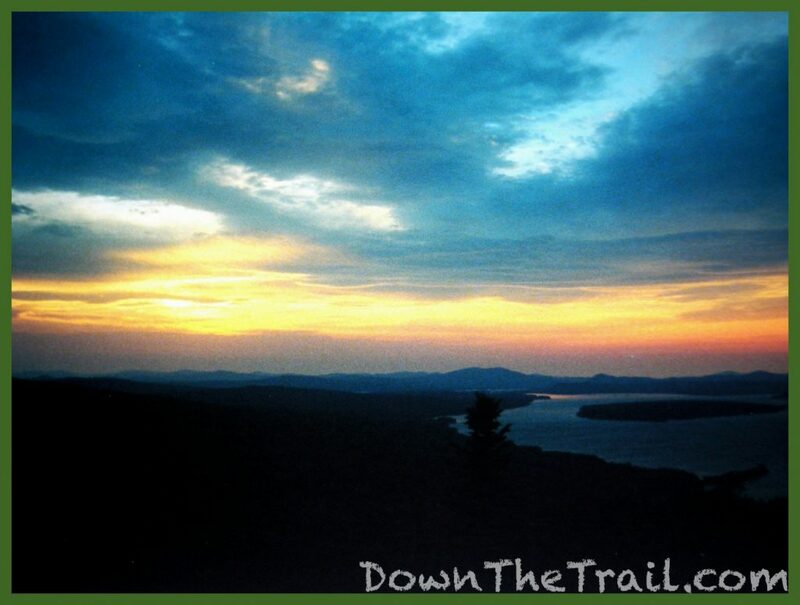 He was here to join Sandfly throughout the best sections of the entire Appalachian Trail. 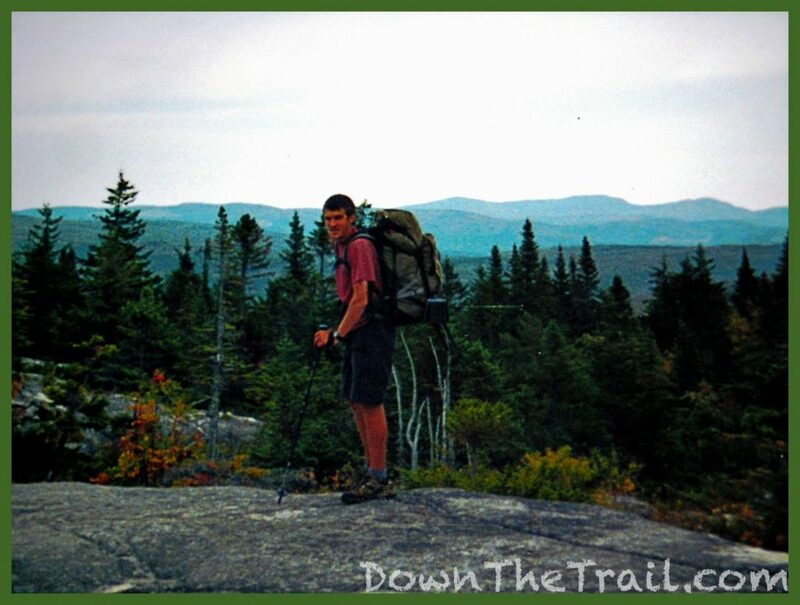 We left Rangely on this day and went up and over Saddleback Mountain, another iconic peak on the Appalachian Trail in Maine. I think I fell behind Hollywood and SoFar and hiked solo for much of the day before catching them prior to reaching the shelter. 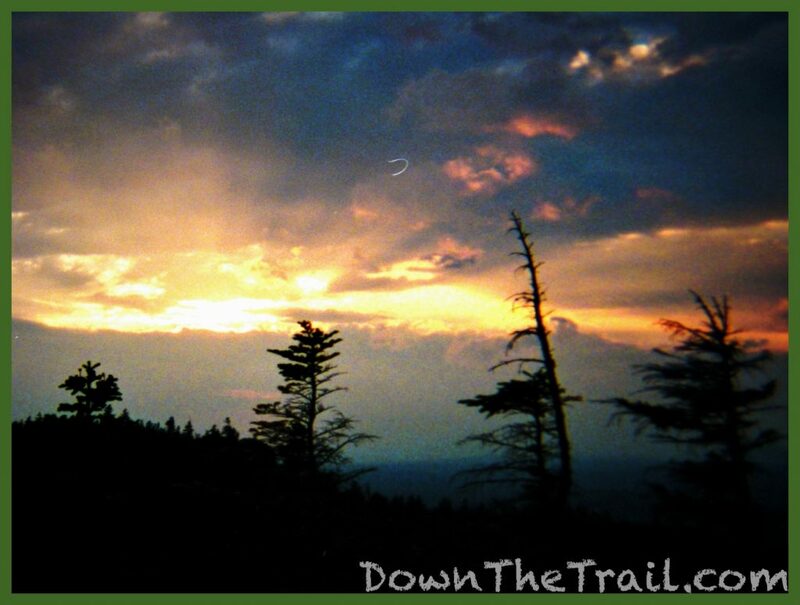 We were still on the trail at sunset, and Hollywood paused to set up his tripod and take some photos of it. Hollywood’s background was from North Carolina. 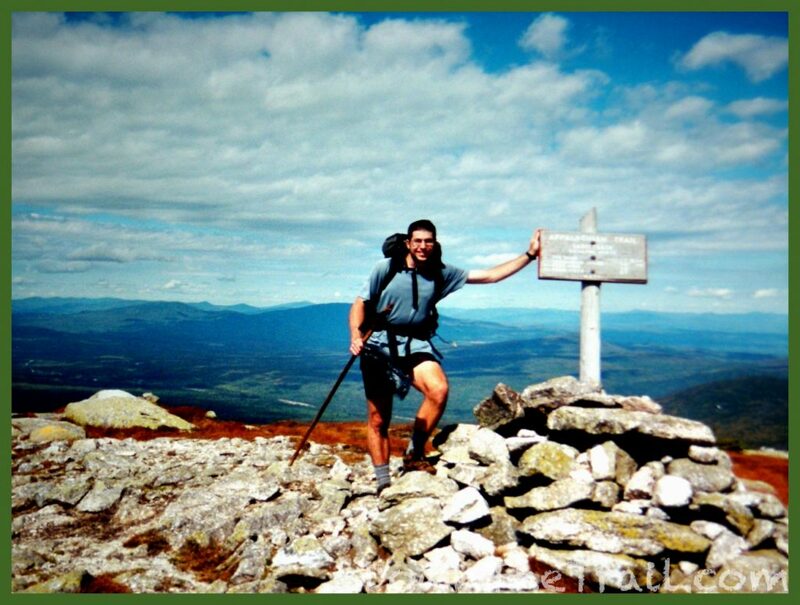 He had a college degree and a “successful” but stressful career before his AT hike. He essentially sold insurance to corporations – he did well for himself but worked really hard and became disillusioned with the way things were in big-business finance. He spent some time living in California and really started to get into photography before the trip. 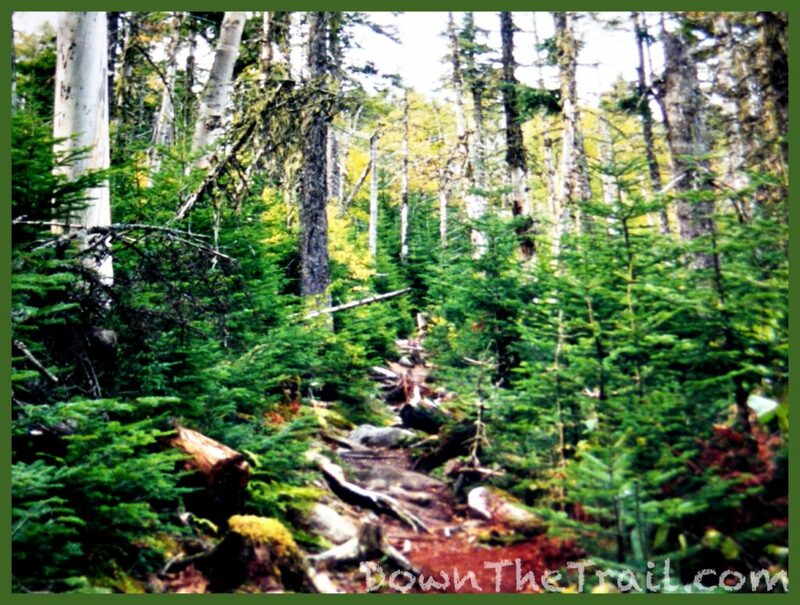 He carried a big, heavy SLR film camera and tripod for the whole length of the Trail. The ever-present camera and time spent in California earned him his trail name. 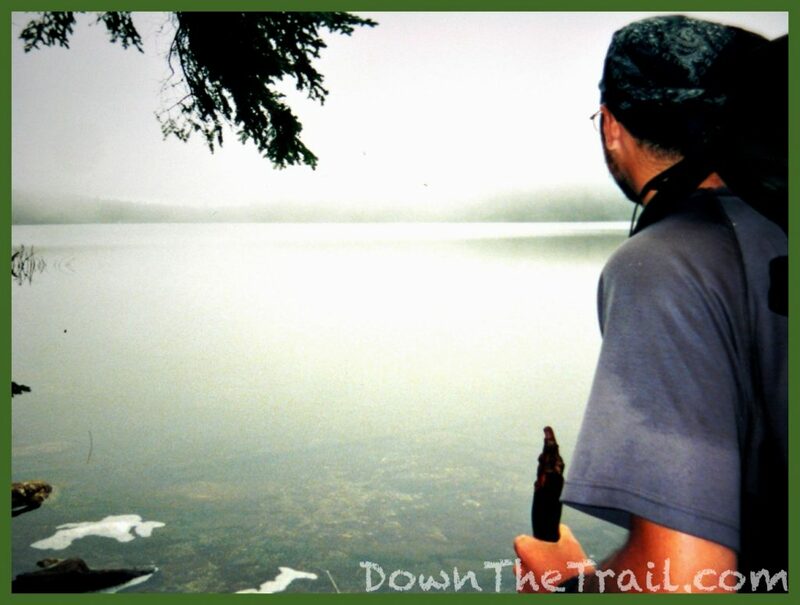 I still carried the disposable Kodak cameras that were available in drug stores, but on this hike in 2002 I’d made a conscious decision to up my game in that department. Namely, I took a whole lot more pictures in 2002. Spending time with Hollywood exposed me deeper into the realm of photography. For example, I think it was on this evening that he taught me the definition of the “golden hours.” Namely it was about how the lighting for photos is always best within an hour of sunset and sunrise. Consider it my first photography lesson.